The shining star of many of Cold Steel's recent performance tests, the All Terrain Chopper will outcut many machetes and even put some swords to shame! The sheer cutting power harnessed within the All Terrain Chopper's big, wide, slant-tipped, fully sharpened blade has to be seen to be believed. 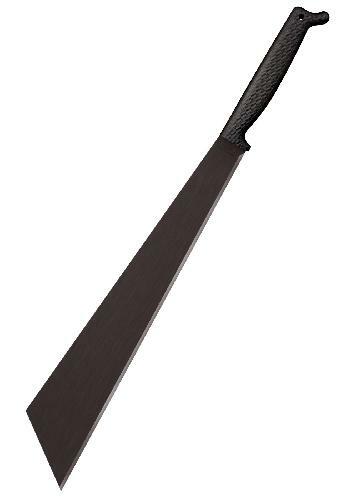 A well-placed swipe from this powerhouse of a machete will lay waste to almost any obstacle the wilderness may lay before you. Worn either slung over the shoulder or across the back in its weight-distributing carry sheath, the All Terrain Chopper is surprisingly comfortable even when worn for extended periods of time. Several of Cold Steel's crew members put the carry sheath to the test by wearing the All Terrain Chopper all day while working in the warehouse, training at the gym and going about their usual daily activities. Despite the size and heft of this machete, all reported back that they found the All Terrain Chopper very easy to wear and that they quickly forgot they were even carrying it. Exhaustively field-tested in Australia by Lynn C. Thompson, the All Terrain Chopper proved to be a stalwart hunting and wilderness survival companion. More than just a machete, and the next best thing to an axe, it packed astonishing chopping power into an easy to carry package.